Worth the wait in gold. 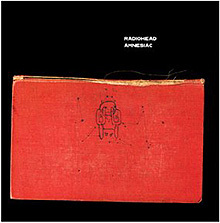 When Radiohead released their album "Kid A" the world thought they had reached the limit of their experimentation, but now with the release of this album, Amnesiac, they have just gone on right through those frontiers like Concorde breaking the sound barrier: (mixed-metaphors notwithstanding) a further step on the fork they took with "Kid A". The rumours before the release of this album were that it would mark a return to their earlier rocky sound of records such as "The Bends" and "OK Computer", but it all turns out to be a media conspiracy. No, this album is as close to that style as a politician to the truth. Beginning with the disarming Packt Like Sardines�, Radiohead merely wave to us as they pass on by, continuing where they left off with "Kid A". This is a good thing. At last we have a group that is determined to push themselves to the limits in order to reveal a new musical existence. For a long time we have been waiting, but finally you have shown yourself. The Second Coming, indeed. The whole album combines infectious synth-pop with orchestrated fantasy with machine sounds, and has a heavy lightness, if ever such a thing were possible. You may initially wonder where the guitars have disappeared to, but not long after, you recognise their comfortable timbre, even if they are imaginatively deployed. Amnesiac makes good use of their resources, producing an eclectic mix of swelling orchestras, warped guitars, delicate defining rhythms, and is similar to "Kid A" in its reverberation and experiment, it was recorded at the same time as "Kid A", so this is natural. Occasionally there is a patchiness to the record as a whole, but this is more then overcome by the good, sorry great, songs on offer. Highlights include the now famous instrument-filled single Pyramid Song, and the backward talking of Like Spinning Plates, (rarely will you have heard a more apt use since the original backwards ditty in The Beatles "Number 9"). Unexpected and hard to stomach at first, despite all the absurdity and experimentation Amnesiac makes perfect sense, and if you can manage to digest it completely, you�ll find it�s worth its wait (in gold). Radiohead are indeed a fascinating lot.